I’m bad at so many things. Taking informative, step-by-step photos and posting replicable instructions about home improvement projects is one of my many weaknesses. One of my favorite bloggers, Daniel at Manhattan-Nest, is so good at tutorials. So perhaps one day he’ll put up some Lincrusta molding and write a much better tutorial about how he installed it. In the meantime, here’s my feeble offering. In order to apply the trim to a wall, you need to get the curl to relax and the product to soften, so you are advised to soak it in hot water for about twenty minutes. Where I only needed a short amount (between doors and such), I cut off the needed amount (NB: the lincrusta expands when wet, so cut off a bit less than you really need — maybe 1/4 inch less). For really loooong sections (the stairs), I cut off about 3 foot sections. I used a razor blade and a rotary cutting mat to do the cutting. 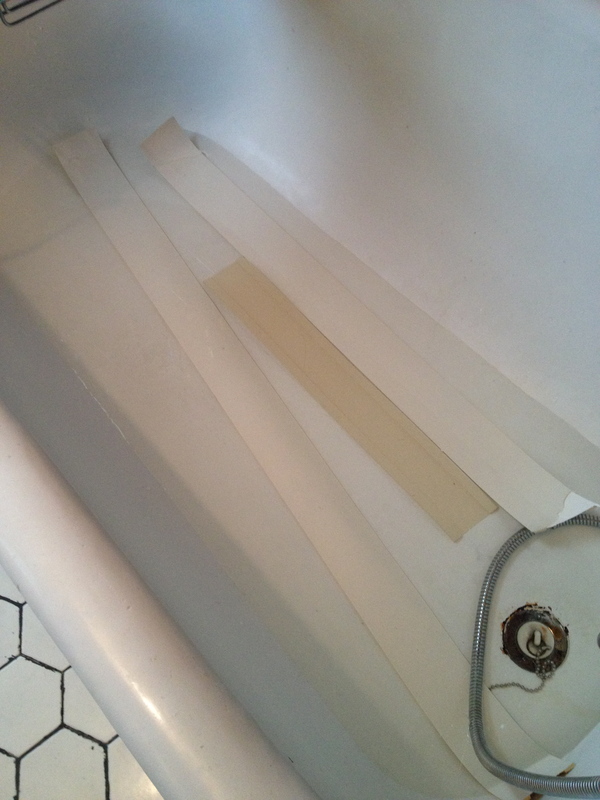 Then I put three or four sections in the tub at a time and let them soak in warm water. Lincrusta pieces soaking in tub. If the sections were longer than 3 feet or so, they would stick out of the tub and I’d have to move them around so they were equally wet. Then I put them on the pasting station (i.e. bathroom sink) and applied “vinyl over vinyl” adhesive with a paint brush. Really goop it up. You’ll have to use your imagination on that part, as I forgot to take a picture. Then you put it on the wall. 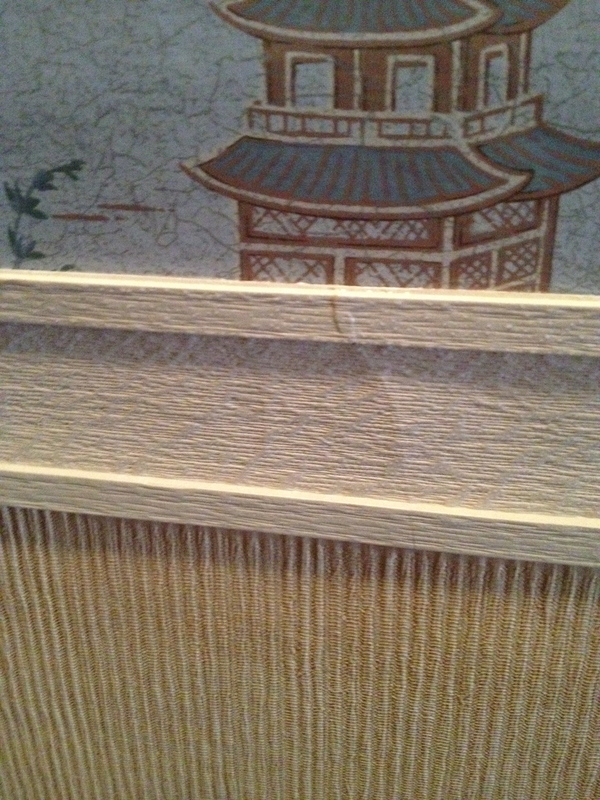 I put it over the wallpaper and over the “grasscloth” (textured vinyl wall covering). Press it down and use a wallpaper roller to really get it to stick. Again, please use imagination. If you press it together along the crack and then caulk it later, it’s barely noticeable. And I personally have very low standards, so it’s fine with me. To manage the curves and the dips and the general rise of the wall, I used short sections (a foot or so) when I needed to change the angle. This worked fine for me. There were gaps between some of the joints (although I did angled cuts where possible). After it has been up for about a day, you’re supposed to caulk the gaps, using acrylic caulk. Did that. 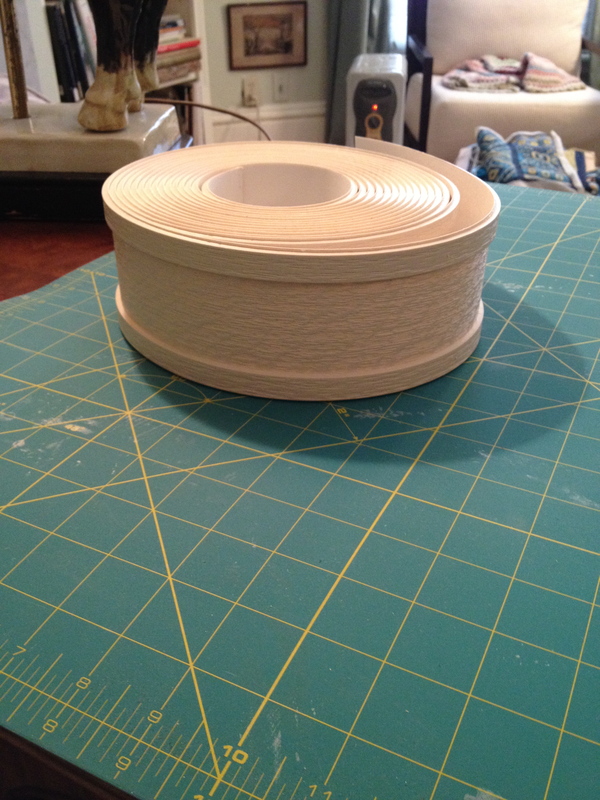 Then you’re supposed to prime it with an acrylic primer OR paint with oil paint (now not sold in Massachusetts). So I primed it and painted it thinking that would cover the gaps up pretty well. This happened with varying levels of success. There’s one part right by the front door where it looks really quite crappy, but again, it’s done, and that’s what matters most to me. Sort of choppy Lincrusta install. But the perfect is the enemy of the good. The Halls — They’re Done! After 12 long years (actually they sort of flew by) of looking at the dingy hallways and grotty stairs, I now have gorgeous, lovely, clean and beautiful walls, creamy spindles, and squishy green carpet. Hip, hip, hooray! The carpet was installed on Wednesday and it looks quite beautiful. The installation was a bit of an ordeal, and the work scratched up the paint on all the baseboards (so they had to be repainted) but it’s done now. There is a bit of a rest home chic to the whole appearance, but it’s working for me. Painting the spindles was a tremendous ordeal. There are still some spots here and there that I missed, but I’ve decided they add character. The members of Flaw-Pointers International (certain friends who hone in on imperfections) can go to hell and just leave me alone, because I think it all looks great. I moved into my wonderful dream home twelve years ago today. My how time flies! I don’t have any photos of the house when I first arrived (due to a 2006 computer crash that cost me all the photos from 2002 – 2006), but let me tell you, it looked a lot different. 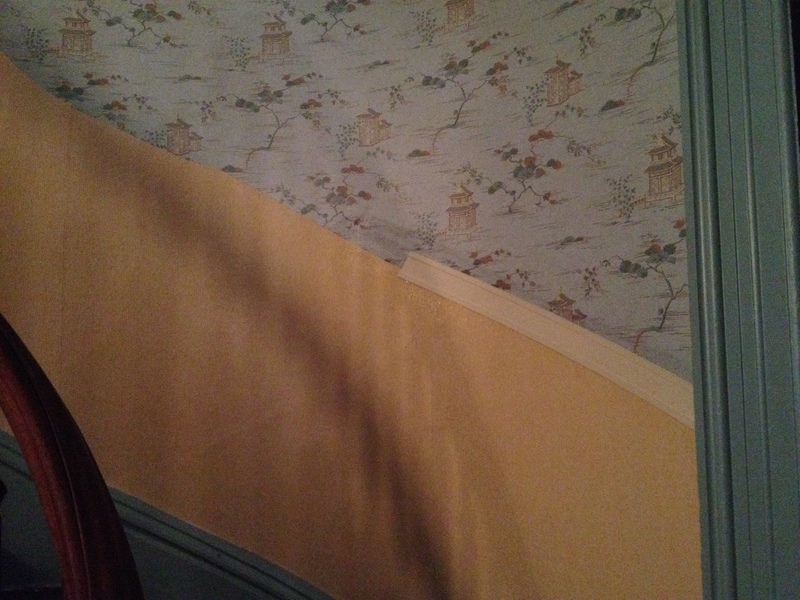 All the walls were white (except for the hallways, which were papered in a dingy damask). 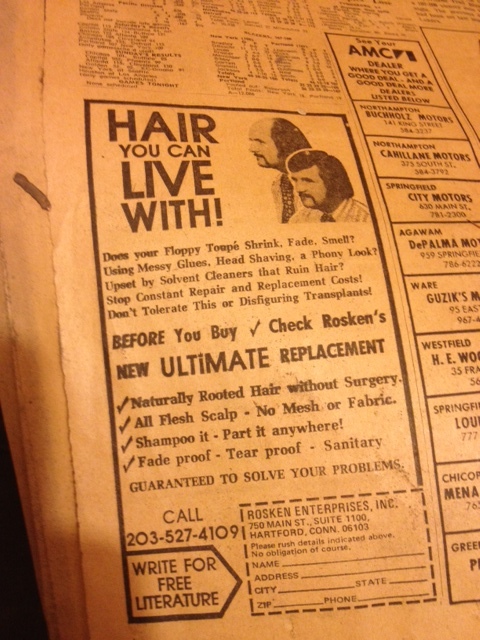 Most of the floors were painted brown with lead paint or had very gross industrial carpet on them. There was no kitchen. Most of the rooms had live gas for a stove and a couple had wall-mounted sinks. 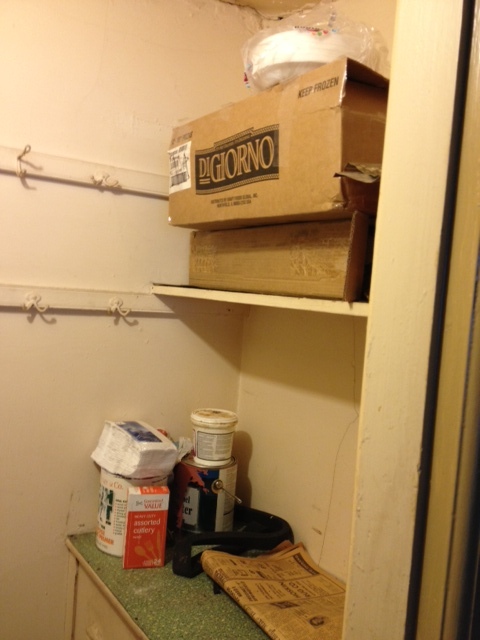 (My house had been a rooming house for single men for nearly 70 years and each man did his cooking in his room). There was one bathroom. I had grand plans to totally renovate the house from roof to basement in ten years. I also had a job that paid about double what I’ve been earning for the past several years, so needless to say, my plan did not go according to plan. But even though the ten-year mark was two years ago, I have kept up a fairly steady pace of renovations, plugging away and doing what I could (or what I foolishly thought I could) do on my own and hiring people to do what I couldn’t. Ever since I moved in, I’ve longed to do the hallways/staircases over. They were dingy. The paper was peeling. The walls were cracked. The stairs were painted brown with strange (but functional) black rubber stair treads. And now, twelve years on, they are nearly finished! Good friends are coming tomorrow to risk their necks hanging the paper (and prepping the wall) in that terrible coffin corner. Then I’ll have a bit of touch up painting to do, and our work will be done. I know what needs to be done for the chair rail installation, but I do not have the patience, skills, tools, or ability to do it. So I’m going to hire a handyman for that and hope it will be done in March. 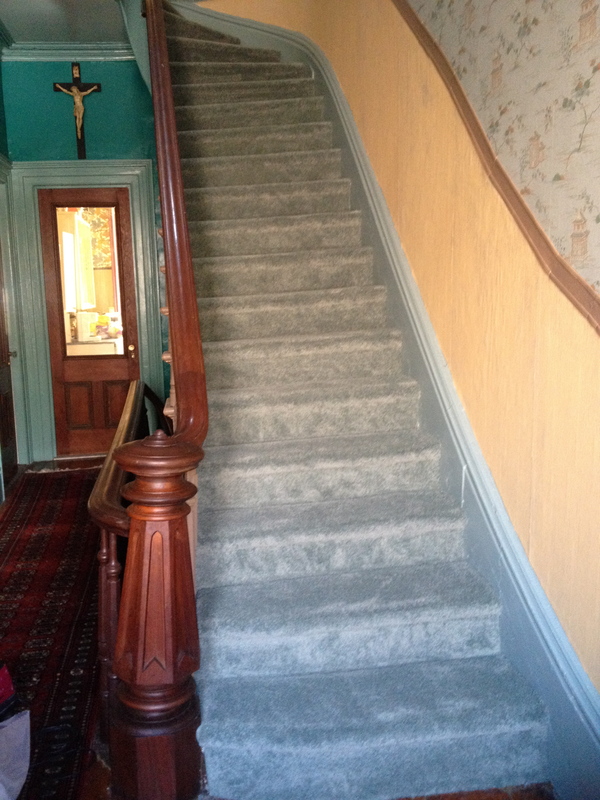 Am also going to start painting the stair treads and spindles this month, in anticipation of choosing a carpet for the stairs and having it installed in May. This wallpapering makes me deeply, profoundly, inexpressibly happy. It looks great and I am SOOOOO grateful to my several friends without whom I could not have done it (sounds like an Oscar acceptance speech). So lucky to have great, daring friends!!! It has begun. The hallway project to end all hallway projects: hanging two different wallpapers (plus a chair rail of some sort) in the very tall, very inaccessible hallways on the 4th/3rd/2nd floors. 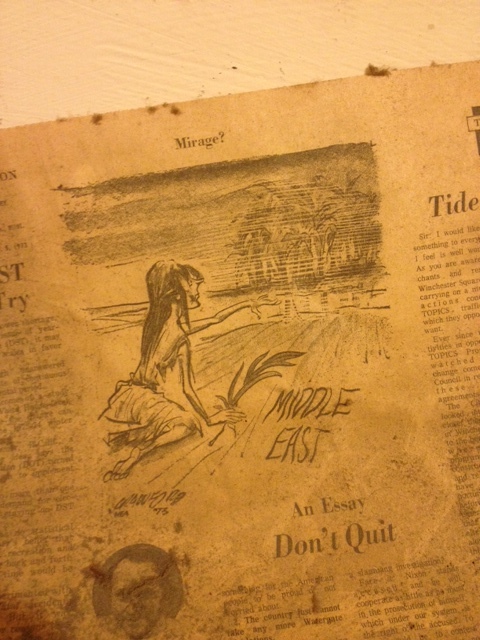 I began by scraping loose pieces of paper from the walls and paint from the trim. Then I removed the fire extinguisher hangers at the top of both stairwells and patched the holes (one patch is still in progress). Primed the walls with Kilz, as I feared that the 40 years of dinge, cigarette smoke, and home improvement dust (and regular old dust) might seep through to the pretty new paper. Painted the moldings and doors and papered what I could on my own on the 4th floor, then called in some very brave and generous menfolk (the ones who did the stripey hallway a few weeks ago), one of whom clambered up on top of the scaffolding platform (Baker’s scaffold) I bought from Home Depot for this project. The platform cracked when stood upon. It was terrifying. AND we needed to put a 10 foot ladder on top of the scaffolding on the stairs. God bless that Patrick for having the guts to do that — he said he felt very comfortable on the platform, but I think the bystanders were plenty nervous. I keep messing up with inserting the photos, so I’ll have to do separate posts. Today was one of my favorite days. Evah! 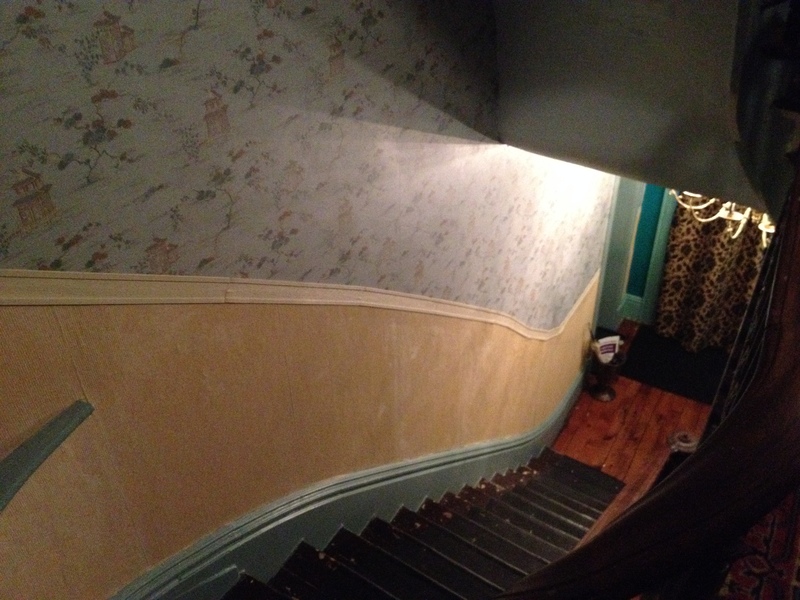 Three friends came over and wallpapered the stripey stairwell from the ground floor to the first floor. Some years ago (maybe 2011? August 2009, so four and a half years I’ve been trying to finish this! 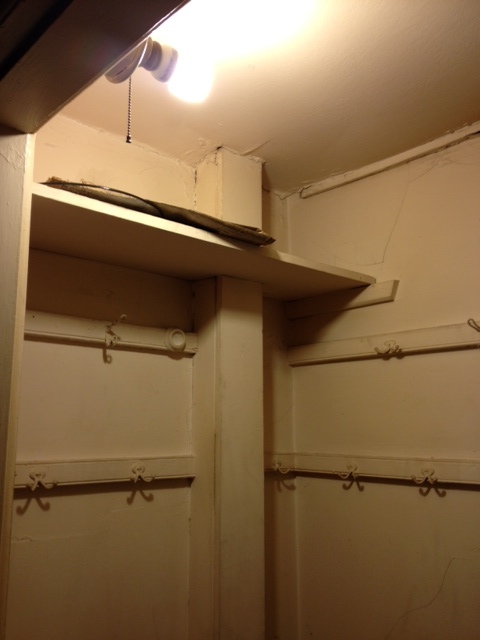 ), I managed to wallpaper the downstairs entryway walls, ceiling, armoire, electric sockets, etc. with a wonderful black and white striped wallpaper (from York — pattern IN2803, in case anyone wondered). I had to stop at the stairwell due to my inability to reach the walls. I had tried to use one of those crazy bend-any-way ladders on the stairs to complete the papering, but it was way too scary. So after years of trying to pay someone to do it and their either (a) not coming or (b) being way out of my price range, I started asking friends if they’d help. I finally found two friends who said yes and who came with their own ladder even. And of course, trusty Liz, my wallpapering guru, also shared her time and talents. It took a total of three hours and my daring friend on the ladder also painted where I couldn’t reach with the teal. It looks so, so, so, so, so wonderful. I’ve just been standing there staring at it. What a quick transformation. This project was wonderful in and of itself, but what is also fabulous is that the guys have agreed to come back and work their magic on the other two stairwells. It is quite possible that my stairwells will be papered by the end of February. AMAZING!!! Had an uncharacteristic burst of energy this morning — fueled by iced coffee and A.C. Produce‘s amazing Tiramisu. 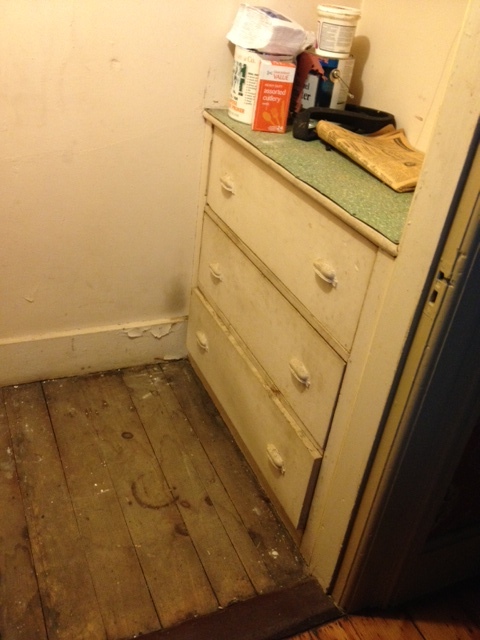 Sometime soon (or later than soon), this will become a little kitchenette space for my AirBnB guests. There’s a water hook-up in there, and I’m pretty sure there’s a drain under the floor, but it might be lead (yeah, really). I don’t think it would be a major undertaking to put a sink in there, but I’m leaning towards just moving the microwave and fridge in there and letting people get water from the bathroom. 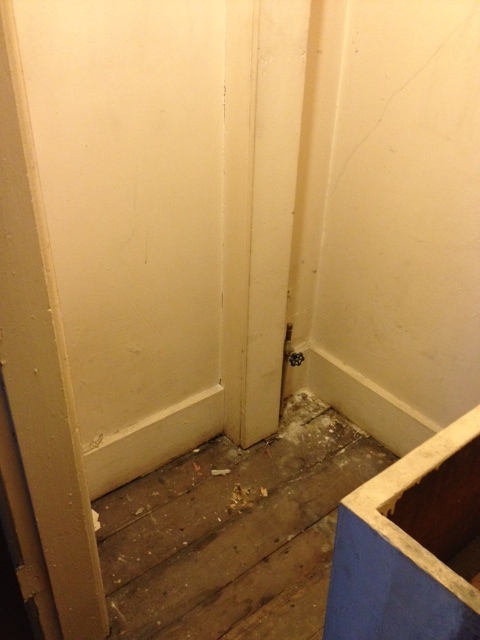 Guests stay for such a short time that going to get water down the hall doesn’t seem like a major imposition. There’s still some removing to do. 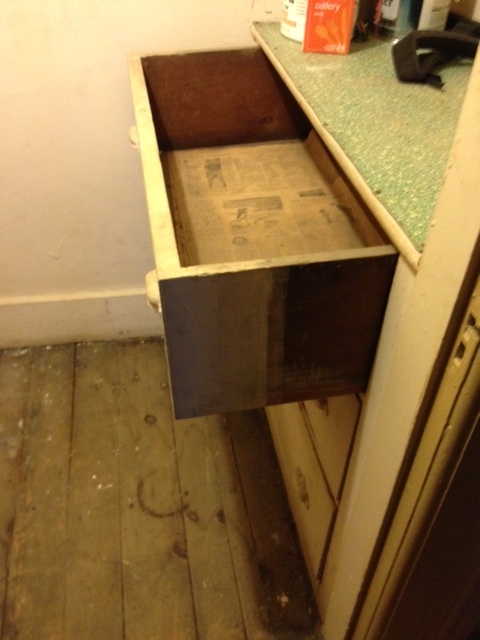 Built-in and nice (real) linoleum on top. Although the closet looks empty, I basically just dragged the contents into the sitting room and piled some up in the “box room” (attic-type space). The energy burst didn’t last all that long, but there’s always tomorrow. Gotta take it slow on these hot days. 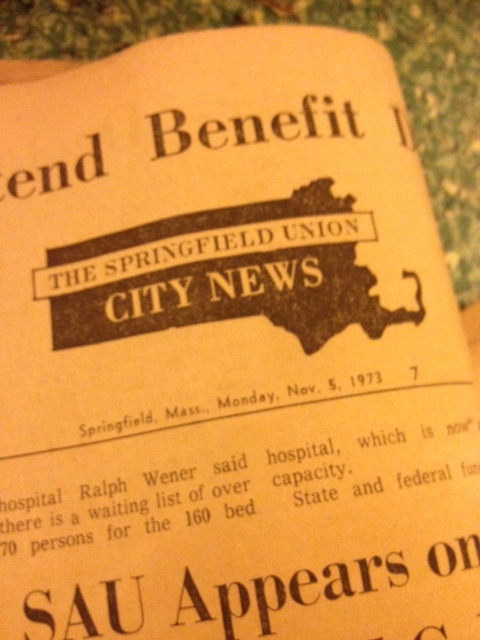 Anyway, here are some views of the 1973 Springfield Daily News that was lining one of the drawers.